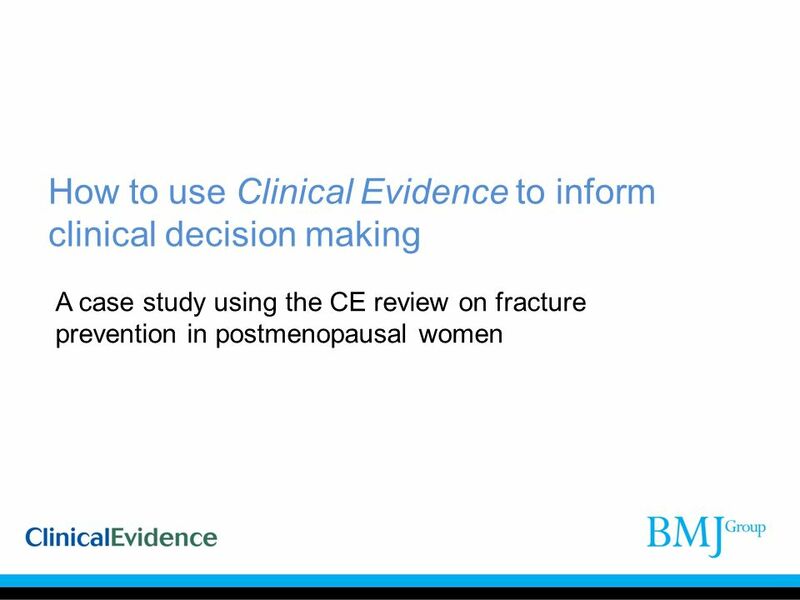 A case study using the CE review on fracture prevention in postmenopausal women The aim of this presentation is to guide you through a case study to demonstrate how to use Clinical Evidence to inform clinical decision making. 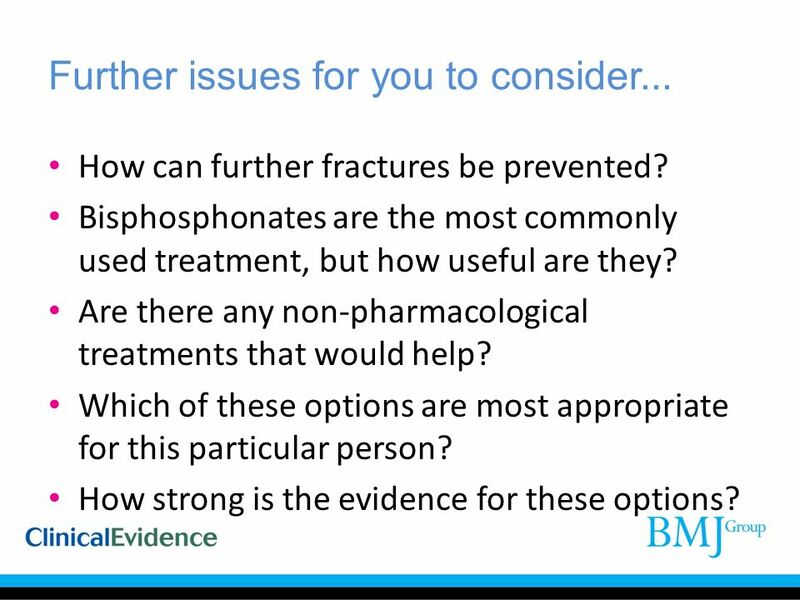 How can further fractures be prevented? 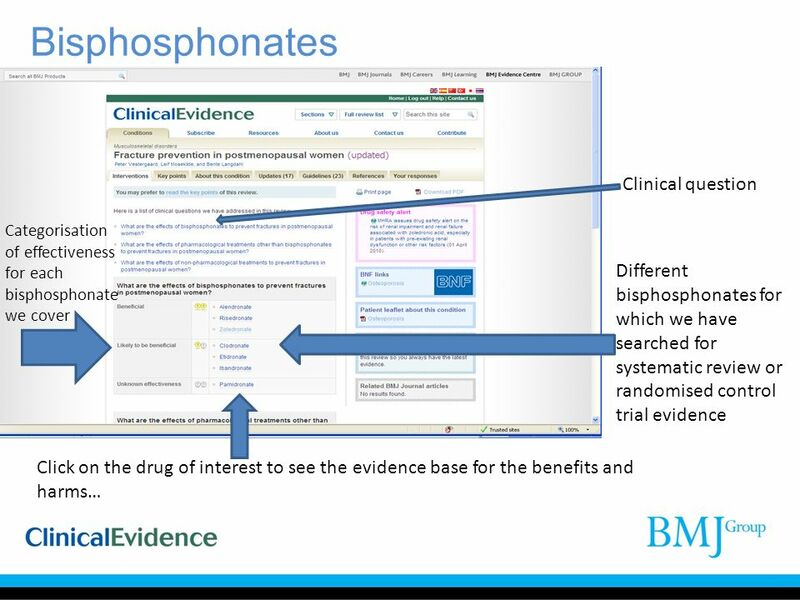 Bisphosphonates are the most commonly used treatment, but how useful are they? 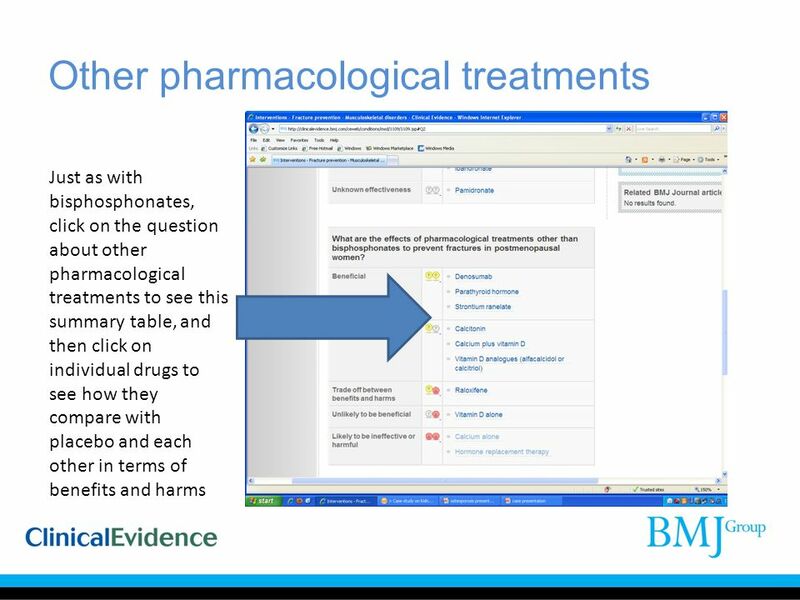 Are there any non-pharmacological treatments that would help? Which of these options are most appropriate for this particular person? 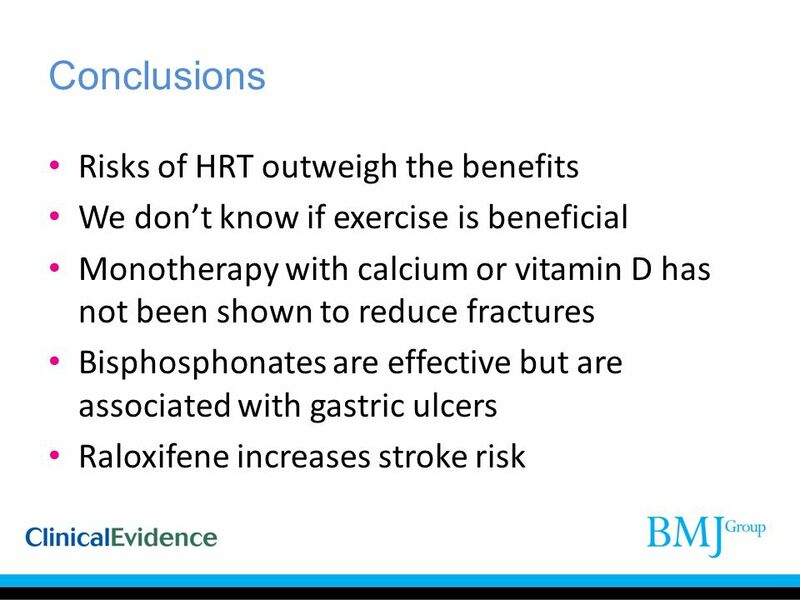 How strong is the evidence for these options? 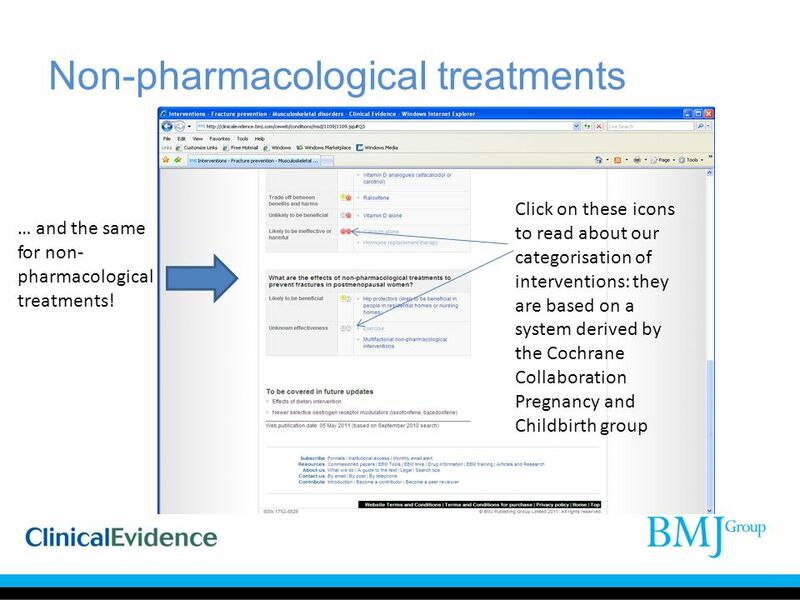 Click on these icons to read about our categorisation of interventions: they are based on a system derived by the Cochrane Collaboration Pregnancy and Childbirth group … and the same for non-pharmacological treatments! 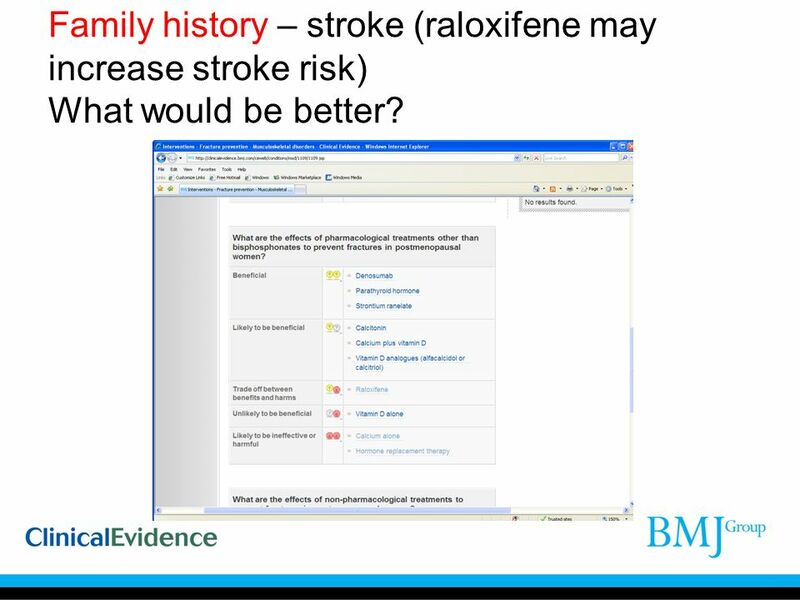 13 Family history – stroke (raloxifene may increase stroke risk) What would be better? 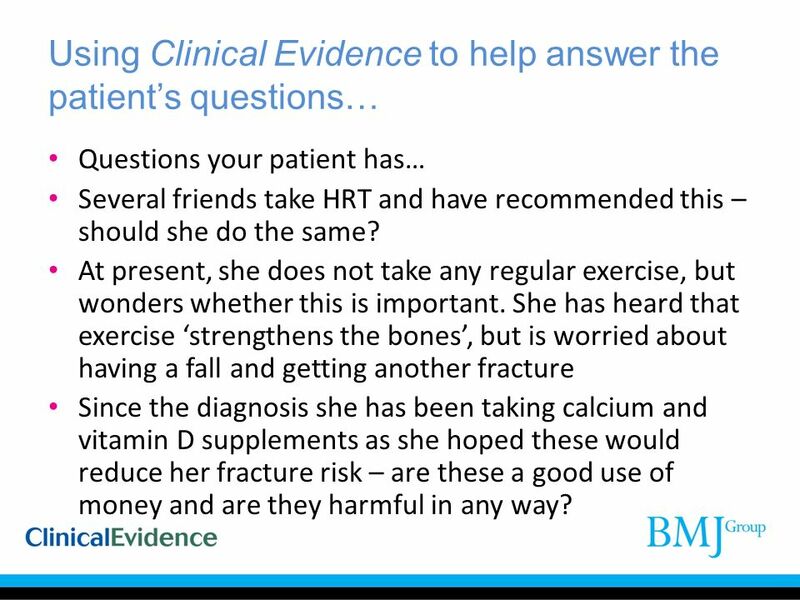 Questions your patient has… Several friends take HRT and have recommended this – should she do the same? At present, she does not take any regular exercise, but wonders whether this is important. 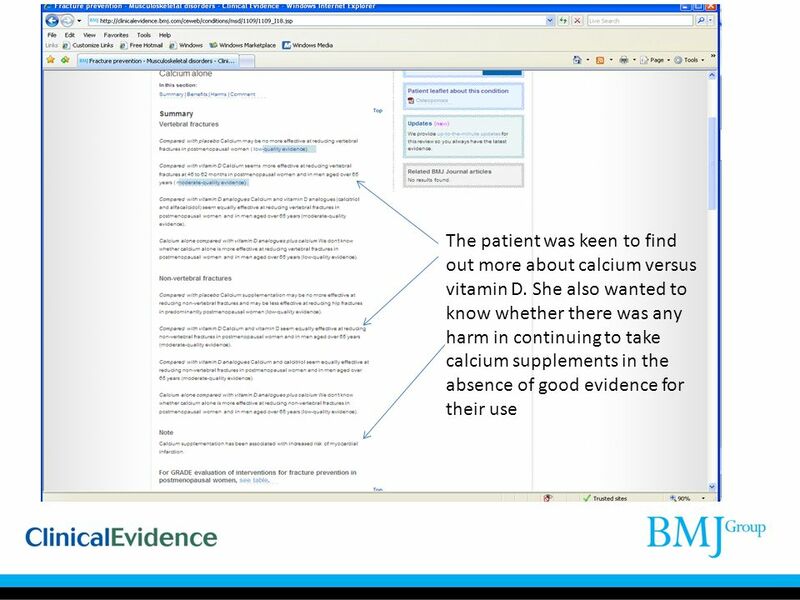 She has heard that exercise ‘strengthens the bones’, but is worried about having a fall and getting another fracture Since the diagnosis she has been taking calcium and vitamin D supplements as she hoped these would reduce her fracture risk – are these a good use of money and are they harmful in any way? 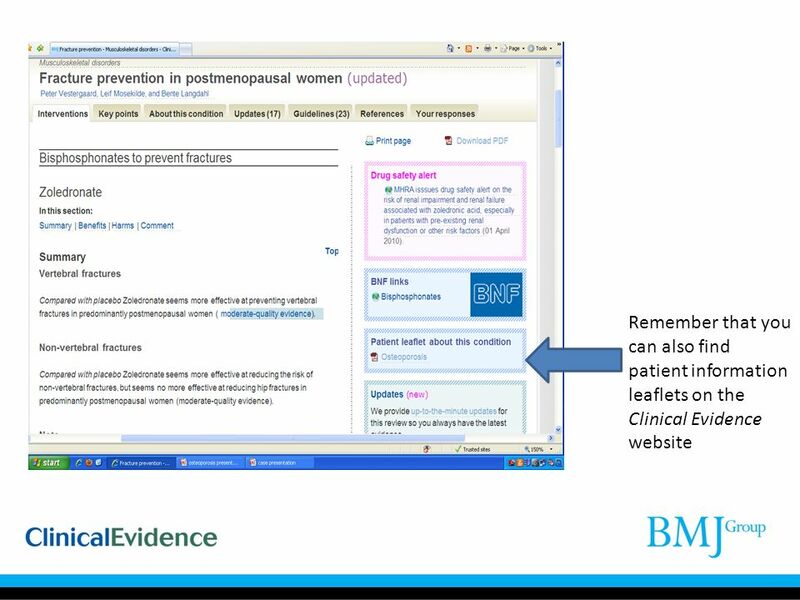 Download ppt "How to use Clinical Evidence to inform clinical decision making"
February 2008 Providing evidence based resources. 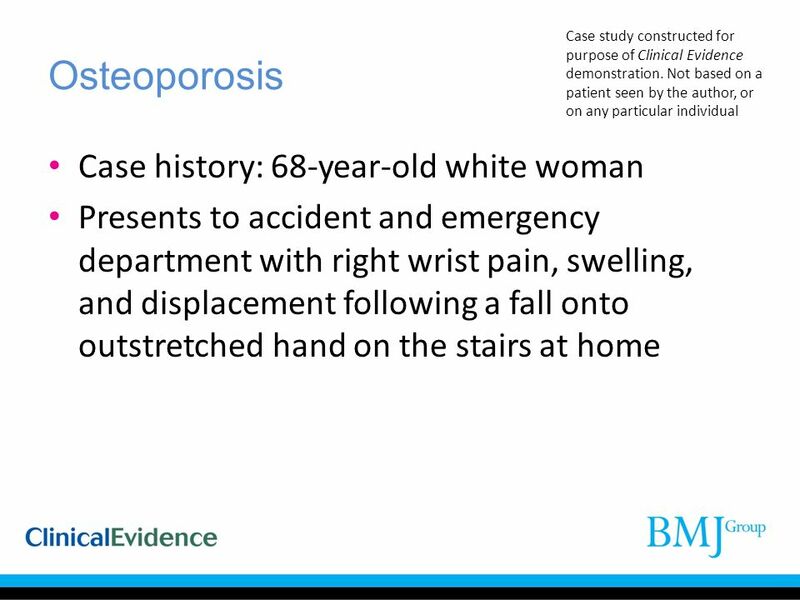 Osteoporosis Daniel K. Park, MD. Osteoporosis Weakening of the bones. Osteoporosis Dr. Aisha Sheikh FCPS (Pak), Fellowship Diabetes/Endocrinology (AKUH), PG Dip Diab (UK) Consultant Endocrinologist. 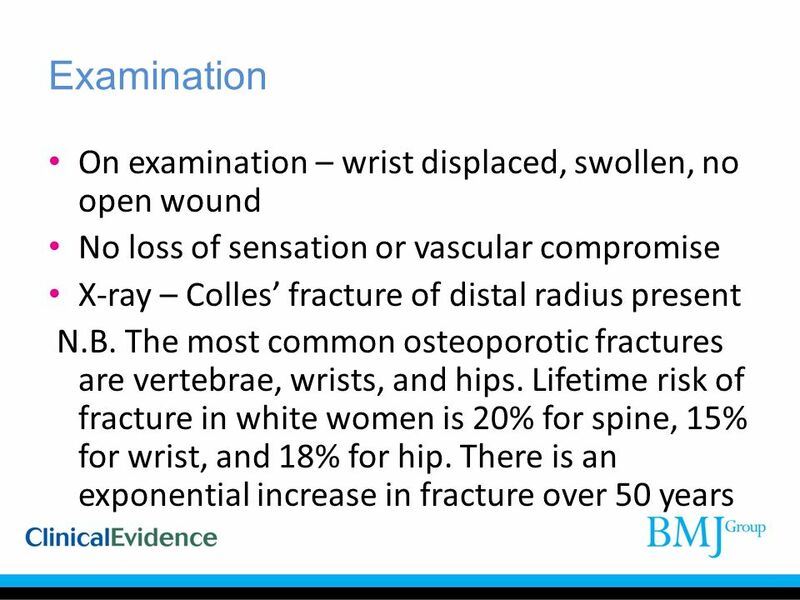 A progressive bone disease characterized by decrease bone mass decreased bone density increased fracture risk Dr Gaurav Rathore MS Ortho, MCh Ortho, FRCS. 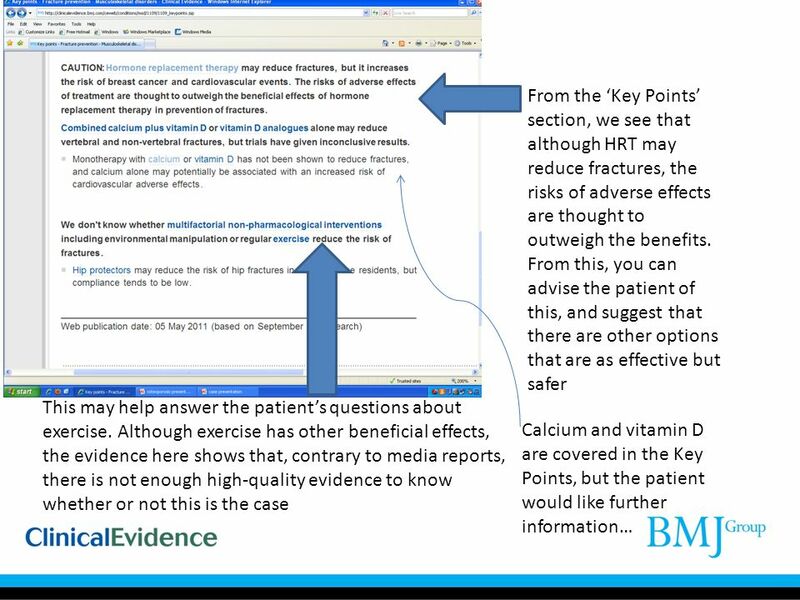 The FRAX tool for Osteoporosis Should all GP’s be calculating the Frax score prior to treatment Dr Sanjeev Patel Consultant Physician & Senior Lecturer. 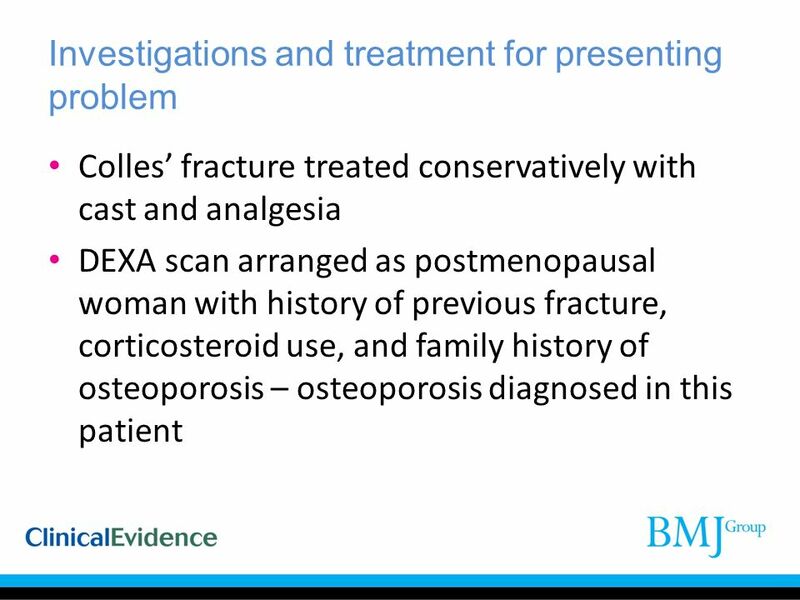 Update on Osteoporosis Dr Terence O’Neill Consultant Rheumatologist. The Cochrane Reviews of Acupuncture Doris Hubbs, MD, FACP April 26, 2013. Dr. Zhao TCM Help Osteoporosis! The Family Planning Clinic. 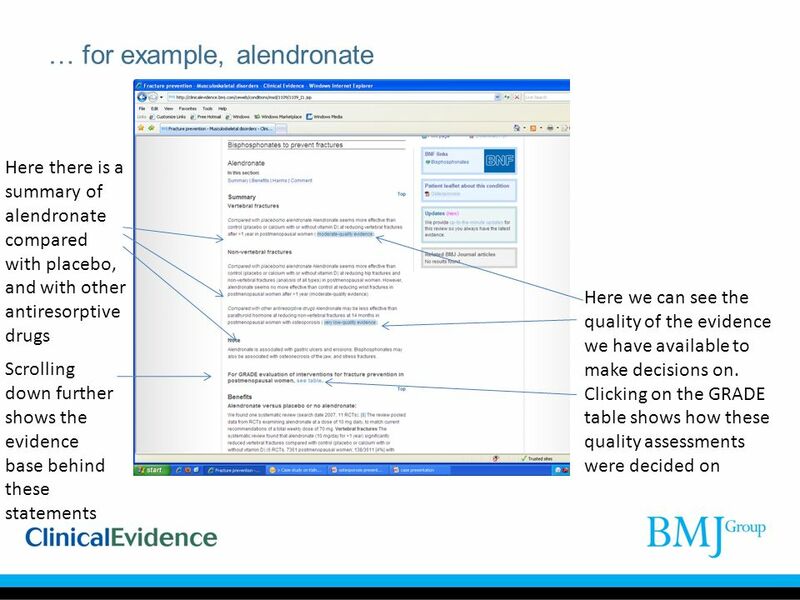 For each of the cases Consider the factors raised by the case Advise about options, including alternatives. 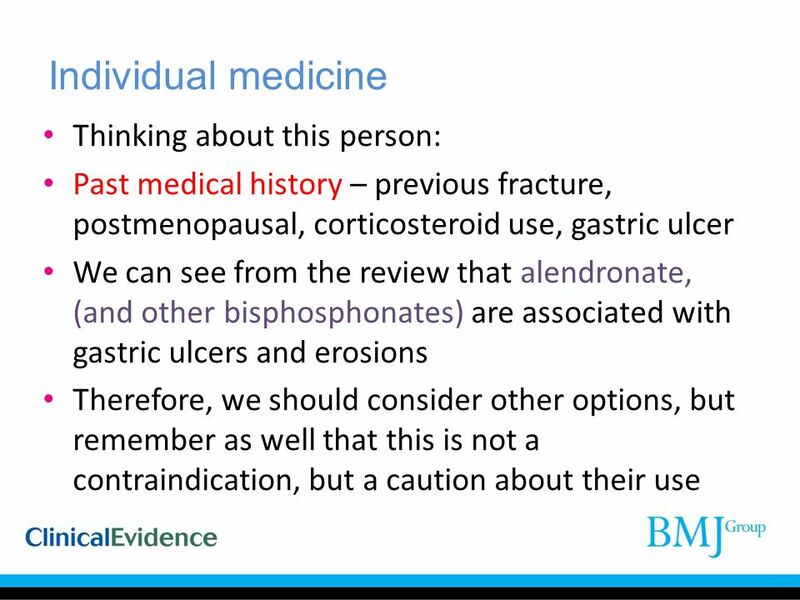 May 2014 Case Discussion: Asthma in Pregnancy. Consider Jane… Jane 23 yo child care worker Presents 10/40 pregnant unplanned pregnancy G1 P0EDC 23 September. Osteoporosis By Lacie and Janay. Osteoporosis Created by: Tricia Fleming, University of Kansas Dietetic Intern Tammy Beason, MS, RD, Nutrition Education Specialist, Family Nutrition Education. Case of the week Prof : Faiza Qari. T score of -2.5 in the lumbar spine  A 65 year old female was diagnosed to have osteoporosis (T score of -2.5 in. 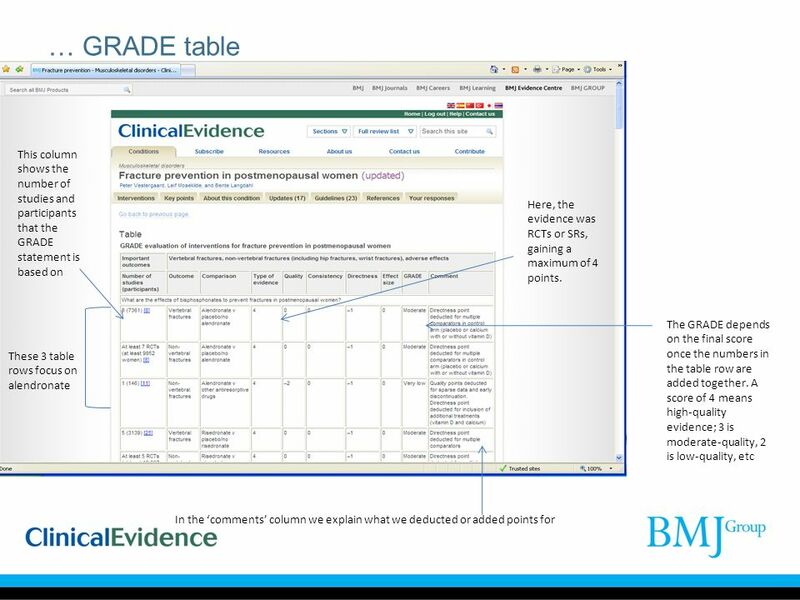 How to use Clinical Evidence to inform clinical decision making A case presentation using the CE review on acne. 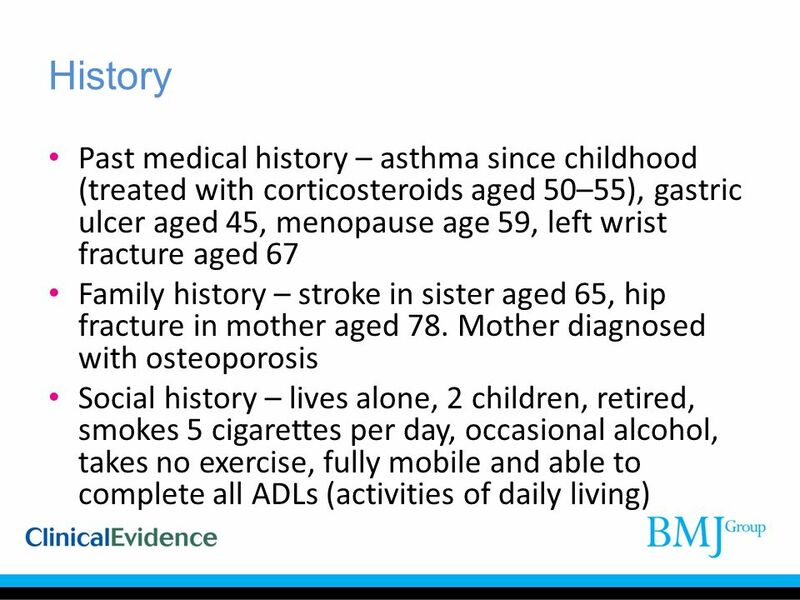 Osteopenia and Osteoporosis Bradley K. Harrison, MD.